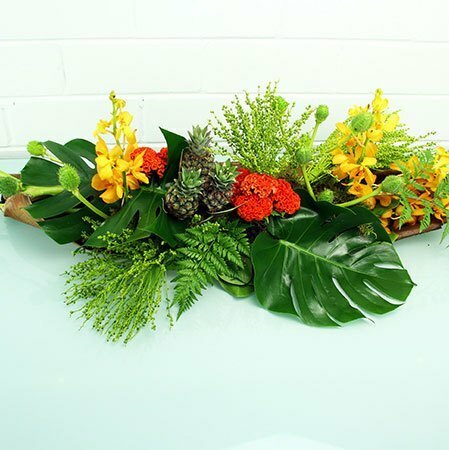 This long and low boardroom flower arrangement features a tropical combination of greenery and blooms to create a professional, stylish look for meeting rooms. Seen from all angles, these boardroom flowers can be customised in any colour to match your decor and corporate colours. 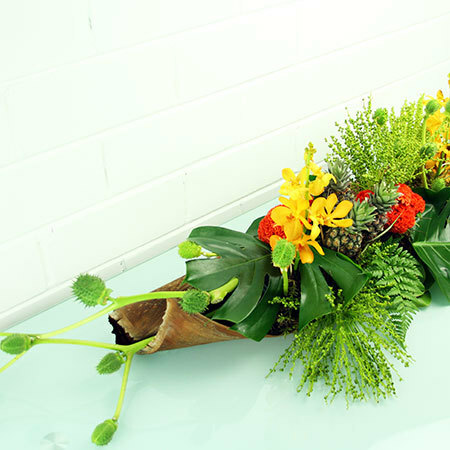 Our florists will then select the freshest, in-season tropical blooms available on the day of your delivery, and arrange them inside a portable palm husk to run down the centre of the boardroom table. To arrange flowers for boardrooms, simply give our florist team a call on 1800 66 66 46 or email sales@flowersforeveryone.com.au. *Please note: Flowers for Everyone deliver office and boardroom flowers in the Sydney metro.